July Fourth is all about BBQs and celebrating outdoors, so whether you are having a party or going to one and need a dish to bring, here are some of my favorite recipes for backyard parties. Hopefully the weather will cooperate this year! Pico de Gallo Salsa – Zero points. If you are lucky to have fresh tomatoes in your garden here is a great recipe that everyone will love and is easy to make. Serve with some baked chips for a perfect appetizer. Chick Pea and Roasted Pepper Dip – This healthy dip is easy to make and taste great with crudites such as cucumbers, peppers, zucchini and celery. Pita chips are also great on the side. Guacamole – Your guests will devour this. Serve with light tortilla chips on the side and watch it go! Macaroni Salad with Tomatoes – What’s a BBQ without the macaroni salad! Everyone will love this, I promise! Potato Salad with String Beans – This is my friend Julia’s recipe who is a great cook! She can make dirt taste great and this potato salad is amazing. Light with no mayo, just really good extra virgin olive oil. Baby Red Potato Salad – An absolutely delicious potato salad, especially if your not a fan of traditional potato salad loaded with mayonnaise and celery like you find in the deli and it’s only 2 pts per serving. Southwest Black Bean Salad – Corn, cilantro, black beans and avocado. A perfect summer side dish for grilled meat, fish or chicken. Filipino BBQ Skewers – Everyone loves these skewers. I make these at every bbq. Works great on chicken, pork or beef. Best if you marinade overnight. Grilled Rosemary Lamb Chops – If you’re a lamb lover like myself, these are simple to prepare and taste great. Swordfish Burgers – Also works great with tuna or salmon. Very healthy alternative to beef burgers. Asian Flank Steak Skewers – Ginger, garlic and sesame oil give these skewers a wonderful flavor. Blueberry Cream Pie – A no bake pie that is super light and takes 5 minutes to make. No-Bake Cheese Cake – Low in points and delicious. Strawberries and Cream – Strawberries are sweet this time of year and when filled with fat free whipped cream, this makes a delicious low point dessert you won’t feel guilty eating! Mango Bellinis – What’s a party without cocktails! These tropical bellinis are very summery. Skinny Mojitos – My personal favorite cocktail!! If your like me and have lots of mint growing in your garden, here’s a great way to use it! Wine Spritzers – If you’re a wine lover, lighten them up and make spritzers! This is the best list ever and I'm bookmarking it immediately! 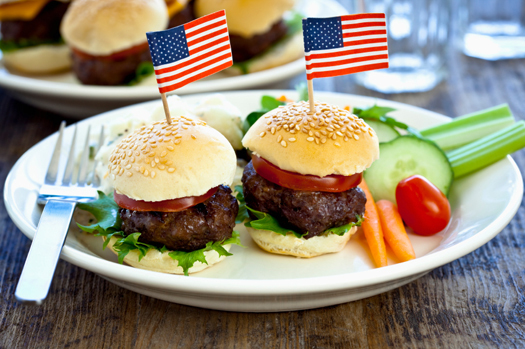 What a wonderful list of ideas for the 4th of July or a summer bbq! I will definitely be trying some as soon as it's summer here again… lol it's freezing at the moment!! What a great collection of recipes! Something for everyone! Thank you! Can't wait to try some of these out. Those are some fabulous ideas! Thanks for pointing out ways to eat healthy even on a food filled holiday!